There are numerous ways to make a chicken curry recipe. Every time you can try out mixing different wet and dry masala. 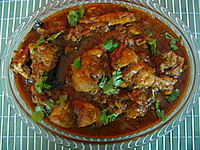 The typical flavor in a curried chicken comes from the herbs, spices and other ingredients (used in making the masala). Indian chicken curry means a chicken dish which contains a little gravy in it. Chicken recipes that have gravy go well with an Indian bread (naan, tandoori roti or chapati) or rice (pulao). * 1 Tbsp oil and more oil for deep frying. Blend the ingredients mentioned under marinade. Cut the Chicken into bite size pieces and mix with the marinade. Leave aside for 2-4 hours. Meanwhile, thinly slice the onions and deep fry in oil until golden brown. Drain on kitchen paper and allow to cool. When these onions come to room temperature they will become very crisp. Crush them roughly. This fried onion is the same 'barista', used in biryanis. In case you want details on frying onions, please check out step 2 of this chicken biryani recipe. Heat a tablespoon of oil in a pan and crackle the cloves, cardamom, bay leaves and cinnamon. Now add the chicken along with the marinade. Add the turmeric, coriander and chili powder. Also add the crushed onions. Bring it to a boil and then simmer until chicken is cooked. Stir every 5 minutes. Add the salt, cashew nut and almond powder. Lastly add the garam masala powder. In case there isn't enough gravy, add 1 cup of boiled water. Garnish with fresh coriander leaves. Enjoy this chicken curry recipe with chapati, tandoori roti or any other Indian bread or rice. Did you enjoy this chicken curry recipe? Try out some more quick easy chicken recipes here.